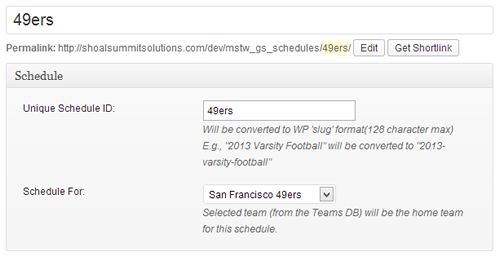 The Schedules menu item allows you to link the teams from the Teams DB to Schedule ID’s (slugs). This essentially identifies the home team for a given schedule. When you add or edit a schedule, you see the screen shown below. The following paragraphs describe the fields on this simple screen. Unique Schedule ID.. Be as descriptive as you want, but realize that this entry will be converted to WordPress slug format. For example, “2013 JV Basketball” will be converted to “2013-jv-basketball”. Since you may accumulate a large number of schedules over time, a descriptive and consistent naming convention is recommended. If left blank, this field defaults to the slug created from the Schedule Title.